Cosmonaut Gennady Padalka and NASA astronaut Michael Barratt work to attach new antenna sets to the Pirs docking compartment that will help prepare for the arrival of the Mini Research Module 2 in November. Two spacewalkers successfully installed a set of antennas onthe International Space Station to prepare for the arrival of a new module thisfall. 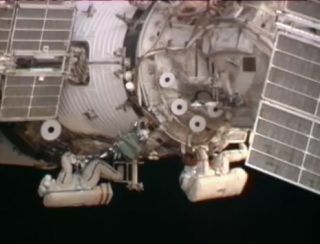 Russian station commander Gennady Padalka and NASA flightengineer MichaelBarratt labored for almost five hours outside the station's Pirs dockingcompartment to attach the antennas. The new equipment will serve as anavigational beacon to guide the attachment of the Mini-Research Module 2, anew compartment and docking port that will be launched toward thestation in November. Padalka and Barratt were able to accomplish all the goals oftheir spacewalk despite a slow start after a minor glitch with theirspacesuits. Before stepping out of the Pirs docking compartment, the twospacewalkers read measurements of abnormally high levels of carbon dioxide insidetheir suits. They were both wearing new, updated versions of the traditionalRussian Orlan suits used for spacewalking, which had been fitted with differentelectronic control systems and more adjustability in the leg, torso and armregions for comfort. After a series of checks, Russian mission control decidedthe readings reflected faulty data, and not actual high levels of carbondioxide, and gave the spacewalkers a "go" to proceed. Mission controllers checked in with the spacewalkersthroughout the morning to make sure they were not experiencing symptoms ofexcess carbon dioxide. "I breathe normally and I feel OK," Barrattreported about an hour into the spacewalk, which officially started at 3:52a.m. EDT (0752 GMT), about an hour later than planned. Padalka and Barratt arrived at the orbital laboratory inMarch on a Russian Soyuz spacecraft to begin a six-month stay. They arecurrently serving alongside Japanese astronaut Koichi Wakata, cosmonaut RomanRomanenko, Belgian astronaut Frank De Winne, and Canadian spaceflyer RobertThirsk. The latter three arrivedlast week on a Russian Soyuz flight; collectively, the spaceflyers make upthe station's first six-person crew (doubled from the previous crew size ofthree). Wakata assisted with today's spacewalk from inside thestation. After the rocky start, Barratt and Padalka worked tirelesslyto install two sets of antennas and connect each to a series of power cables. Theantennas are intended to help the approaching Mini Research Module 2 gauge itsdistance and angle when approaching the station after the module launches on anunmanned Russian Soyuz vehicle. After attaching the antennas and cables, Barratt climbedaboard the long Strela extension pole to survey his handiwork. While Padalka turneda crank to extend the boom, Barratt snapped photos of the antennas frommultiple vantage points for Russian mission control to analyze to make surethey're installed correctly. "The earth is so beautiful, it's a great view fromhere," Barratt said as they crossed over South America. The sametwo spacewalkers plan a second, shorter spacewalk June 10 to change out acover on a port of the Zvezda service module, where the new compartment will beinstalled. Today's excursion was Padalka's seventh spacewalk and Barratt'sfirst.